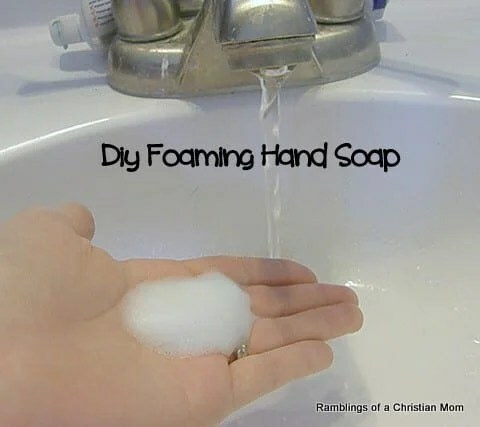 Did you know that it’s super cheap and easy to make foaming hand soap? Here’s how! All you need is an empty foaming soap dispenser, some clear liquid body wash, and water! Pour 2.5 TBSP of your body wash into the soap dispenser. Creamy opaque body washes might clog the pump. Then fill the rest of the dispenser with water. Screw the top back on and shake it really well. That’s it! You just made yourself a full bottle of foaming hand soap for pennies! this is absolutely brilliant, thank you so much for posting this 🙂 When my present bottle is empty I will definitely be making my own now that I know how to. Simple, easy and so much cheaper – that’s how I like it. wow! Thats awesome! Thanks so much for this! Glad you tried it and thanks for letting us know!